Editor’s Note: The following review is adapted from Five Star Apps: The Best iPhone and iPad Apps for Work and Play by Glenn Fleishman. (2010, Pearson Education and Peachpit Press). Whether or not you enjoy being an AT&T customer, there’s no question you’ll like its iPhone account app. myAT&T—the new name for the app formerly known as myWireless Mobile—consolidates all your account-related information in one place and lets you make service changes. It simplifies information retrieval that requires more effort on the company’s Website. 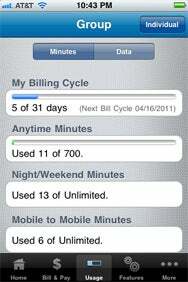 The app can manage multiple lines in a family plan, as well as single-line accounts. Counting the Minutes: With the myAT&T app, you can see just how many minutes you’ve used and how much data you’ve consumed in the current month. With AT&T’s limited cellular data plans, myAT&T is an easy way to check on current usage to see how close you are to exhausting the current billing cycle’s data plan. Tap Usage, then the Data tab. The Features option is also useful whenever you need to modify your subscription services. For instance, when I want to enable AT&T Navigator, I can tap Features, select my number, scroll to AT&T Navigator for iPhone, and tap to turn on the service. (A separate free download of the navigation app is required.) The same is true for AT&T’s new Personal Hotspot feature, available as part of the iOS 4.3 update. If you want to connect other devices to your iPhone, it’s painless enough to click through the Features tab to select the $20-a-month hotspot feature (and the required DataPro $25-per-month 2 GB-usage data plan). The app unfortunately lets you store your phone number and password for quick login. I say “unfortunately,” because even though the password isn’t displayed or accessible, someone who gains access to your phone or steals it could change your account services either maliciously or run up charges. PDFs of bills, including all the numbers you’ve called or that have called you, are also available. I recommend leaving Save Password set to Off unless you use a passcode to protect your iPhone when idle.